- Blend Modes - ZeusDraw now supports Blend Modes. - Improved Gradient Tool - You can now drag and drop colors directly to the gradient when editing gradients in place with the Gradient Tool. - Choice of Mail Programs - You can now use Eudora, MS Entourage, or the AOL mail application, as well as the Apple Mail program, to email artwork from within ZeusDraw. - Improved Export Sheets - When exporting or emailing you can now choose to export the selection, the page bounds, all the artwork or an area. When exporting the selection or all the artwork you can add a margin around them. The sheets now remember the last directory used. - Scroll Wheel Support - The scroll wheel scrolls your drawing vertically. Shift + scroll wheel scrolls horizontally. - Window Size - You can now set the initial window size for new drawings in the Preferences. Saved documents remember their window size. - Check for Update - ZeusDraw now uses Sparkle to check for updates. If a new update is available it will show you the release notes and, if you choose, install the update for you. - About Box - The About box now shows the version number and your registration number. ZeusDraw 1.1 is a free update for current users of ZeusDraw. A 30 day free trial of ZeusDraw can be downloaded from the Chromatic Bytes web site. ZeusDraw costs US$90 and a license may be purchased from within ZeusDraw or from the Chromatic Bytes web store. Chromatic Bytes publishes graphic arts software for the Macintosh. 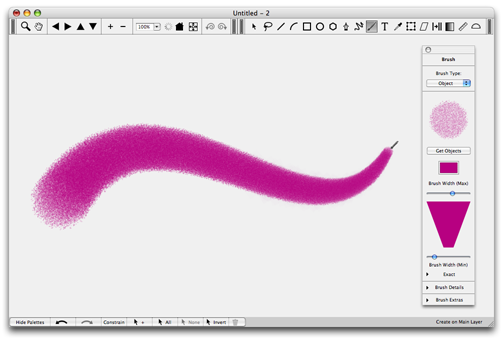 Our current products are ZeusDraw, a vector drawing and painting program, and Shades, an addition to the Apple color picker. We're located in New York City.